Flagler Village, the neighborhood association located just north of downtown Fort Lauderdale, continues its growth of residential property with ArchCo Metropolitan, a planned rental development. Developer BR ArchCo Flagler Village LLC is a joint venture between Atlanta-based ArchCo Residential and Bluerock Real Estate Holdings in Southfield, Michigan. he architect is Atlanta-based Preston Partnership. The project is working its way through city approvals. This 7-story mixed use project has been designed to include 385 residential apartment rentals, about 12,000 square feet of planned restaurant space, and over 14,000 square feet dedicated to shops & retail. 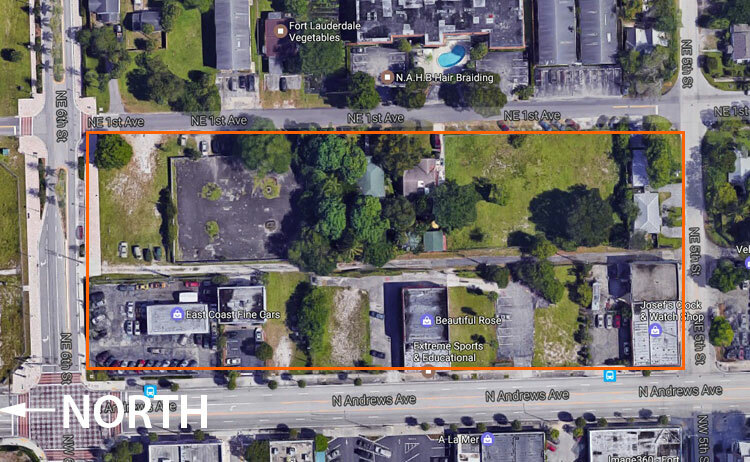 The new development will occupy 1 full block over 3 acres, from North Andrews Avenue to Northeast 1st Avenue and from Northeast 5th Street to Northeast 6th Street (Sistrunk Boulevard). Single family homes and commercial property currently occupy various lots on the combined parcel. The main addresses of the project: 500, 540 and 560 N. Andrews Avenue. The apartments and the commercial space will be designed to be surrounding the 754-space parking garage, hiding the majority of the garage from the street. There will be a walkway between Andrews Avenue and NE 1st Avenue lined with small retail shops. A large interior courtyard is also planned, as well as a large public plaza on Andrews. Apartments will consist of 216 one-bedroom units between 660 to 850 square feet, 123 two-bedroom units of 1,085 square feet and 46 three-bedroom units of 1,425 square feet. On the ground floor some of the apartments would be townhouse-style.